The Texas Social Media Research Institute (@TSMRI): Real Life vs. iLife: Is It A Small World After All? Real Life vs. iLife: Is It A Small World After All? This past December, my parents took me to Disney World for Christmas. One night my mom surprised us with late night park passes for a holiday party in Magic Kingdom. 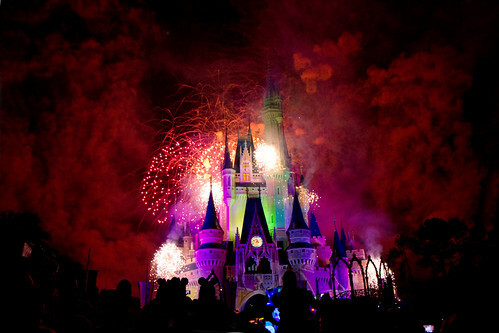 If you haven’t seen a Disney fireworks show, it’s something you’ll never forget. As we stood in a spot on Main Street USA and the show started, I noticed something; there were about 500+ apple IPads blocking my view. Now it could have been my five foot stature and the amount of tall people around me but there were still rectangles pointed at Cinderella’s Castle blocking my favorite part of the night. As I watched the sky gleam with colors, patterns and art; I would often glance at an IPad recording it. I was shocked that so many people were so concerned with recording the whole thing, that they never one looked past the screen to watch the beauty of the fireworks in front of them. These actions intrigued me. I began to wonder how many beautiful things I've missed because I was looking at my cell phone. I am a 20 year old college student majoring in Communications so my phone is always in my hand. I had never thought of technology as an addiction but it very well may be. Cell phones made the world smaller, the internet then made it minuscule. As we focus more and more on the creating and maintaining of online personas through Facebook, Twitter, Instagram, etc. We begin to miss the beauty around us. Thirty five students from Tarleton State University were polled with the same 3 simple questions, “How often are you on your cell phone a day?” Would you say you are addicted to your cell phone?” and “If you went without using your phone for a day, how would you feel?” More than 60% of the students claimed to be constantly on their phones and addicted to them, while the third question said they wouldn't feel lost without their phone just a little out of the loop. Though only 35 students answered these questions I was intrigued. I began to observe my fellow Texans on campus as I walked from class to class. More than 80% of the people I saw were walking with their heads down on their phones. I began to wonder if my fellow colleagues and I were so engrossed in our social media profiles, what if we never put the phone down and became face to face social. I began to look how for ways to on how to make my phone and internet usage become useful for me and for the world. I came across a website called freerice.com. You answer a series of questions and for every one you get right, 10 grains of rice are donated to starving people around the world. Now the way this is paid for is the ads that show up with each question at the bottom of the screen. You are not expected to click on them or anything. Just make sure your ad blocker is turned off or you’ll end up like me with 500 grains of rice added up and them not being sponsored. Another way to cut down your cell phone usage is through Unicef. There is a website you can visit and for every ten minutes you don’t touch your phone a day of clean water is donated through their generous sponsors. You can find more information about it at tap.unicefusa.org. So the next time you find yourself browsing Tumblr for hours looking at kittens in hats or on Facebook stalking the cute guy from your geography class (you know the one with the pretty eyes) take a moment to help out a child in need and put your phone down. Fireworks weren't made to be watched through a lens and neither is life. Alli Rogers is a Communications major at Tarleton State University. Follow her blog, Confessions of a PREM Girl. This post has been reproduced here with permission from the author.